Another Code for 16 SBs! Check the Swagbucks home page - there is a side pop-out with a important mesage! 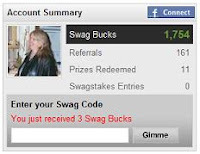 If you have the right code, it will then say "You just received 16 Swag Bucks"!